This beautiful community is one of the San Diego country offerings. It has drawn the interest of the rich and famous not only because of its stunning landscape but because of its prestigious atmosphere. It is the home of the renowned Del Mar Horse races. 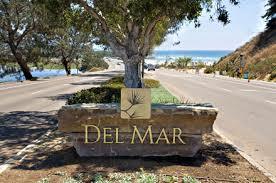 Within the community itself it is comprised of three sections, The Village, Del Mar Heights and Rural Del Mar. It offers the perfect living atmosphere when it comes to its sub-tropical Mediterranean weather conditions. This means beautifully warm dry summers and winter temperatures that very seldom drop below 62 °F. The Del Mar Union School District meets the educational requirements for the residents of Del Mar. The schools have a ten out of ten rating, which the residents here are very proud of. The district is comprised of eight schools. Residents and visitors to Del Mar can enjoy an exceptional shopping experience at the Del Mar Plaza which is home to a wonderful collection of a variety of types of stores. Or for those looking for a more eclectic shopping excursion, then it means a trip to the Village of Del Mar where many fine quality shops are located, and the outdoor patio fine dining brings a great deal of pleasure. Any need for professional services is aptly met in Del Mar, and financial institutions are easily assessable. Del Mar is race horsing enthusiasts dream come true with the premier horse racing track that is situated here. While horse racing is just one form of entertainment there seems to always be some spectacular event taking place here like the annual Del Mar Taste & Art Stroll. Outdoors is certainly where residents of Del Mar wants to be, and there is no shortage of outdoor venues for them to take advantage of. There is a wonderful selection of beaches that are most appropriate for the entire family including the family dog. Then for golf lovers there is the most impressive Grand Golf Club. For some excellent outdoor exercise there are plenty of parks to walk about, or the opportunity to participate is some biking and hiking activities. To really get a bird’s eye view of this wonderful community it can all happen with a balloon ride.